You are bidding on a 100% authentic Gucci Heart Toggle necklace. It is sterling silver. Literally has only been worn one time. The rest of the time it has been stored in its gray Gucci logo pouch. Retail price is $300 tax. This was originally purchased from Saks. You are bidding on the real deal. Ending Apr 28 at 12:39PM PDT4d 19hMetal: Yellow GoldStyle: ChainLength: 20 - 21.99"
The Kuyashii Bee pendant is a minimal pendant that looks great with our 1.4-2mm chains. Inspired by the Gucci bee. Also available in gold. Material: Alloy. Weight: ﻿4g. 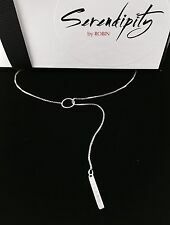 This high polished sterling silver necklace boasts a box link chain with a square drop featuring Gucci’s trademark design. Lock-in luxe style with the lovely lobster clasp and use the 1-1/4" extender if you're looking to adjust the length. 18" GUCCI PENDANT CHAIN. 14K YELLOW GOLD. You've had your heart set on a new pendant, so don't let this Gucci pass you by! Designed with the signature "G" at the upper right, this cut-out is sure to let everyone know you're a Gucci fan. The pendant boasts perfectly polished finish. I bought this necklace about 18 years ago. I have kept it in its original pouch. I always felt like this was a classic Gucci piece and never wanted to let it go. Let's be honest! Metal: Sterling SilverStyle: ChokerLength: 13 - 15.99"
This has never been worn before (12 years old) and is in very good condition. Almost like new. Weight is19.2 grams. I do not know if the chain is silver or not. Ending Apr 28 at 6:02PM PDT5dMetal: Sterling SilverStyle: PendantLength: Less than 13"
10K 1.2mm Solid Yellow Gold Mariner Gucci Anchor Link Necklace Chain 16"-24"
Condition is Used. 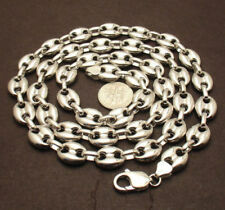 Very nice genuine item hallmarked on both pendant and bead chain fastener. A Beautiful real 14k yellow gold ank charm pendant. Style: Gucci. In one of the picture size is compared to a quarter. Chain Specs. Nice w eight at 7.3oz chunky puffed mariner links that are just over 3/4in wide, just over 1in long and is 31in I’m total length. 10k Solid Gold gucci Chain 4.0 Grams 19" Inch Length Necklace 10kt . Condition is Pre-owned. Shipped with USPS First Class Package. Box, Paperwork & Pouch Included. Sterling Silver. 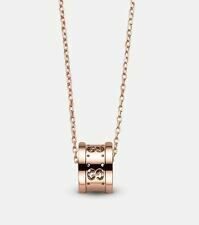 14K Yellow gold Flat Gucci chain necklace. not plated. Authenticated with a 14K stamp. Includes a Lobster clasp to uphold strength and comfort. Material: 14k Yellow Gold 3.5 Grams Approx. Picture is of original chain. 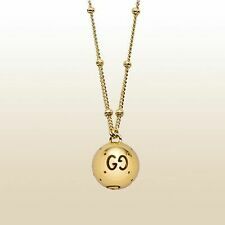 Authentic GUCCI Sterling Silver 925 GG Logo Pendant Chain Necklace. Condition is Pre-owned. Shipped with USPS Retail Ground. Authentic GUCCI Necklace Plate Ball Choker Silver Sterling Silver #3158. Condition is New with tags. Shipped with USPS Retail Ground. Chain : Gucci Chain 10k. Great gift for any age group. Pendant is Yellow Gold. Chain Specs Color: Yellow Gold. Set Weight: 1.7 gram. AUTHENTIC GUCCI SILVER FLOWER AND BUTTERFLY PENDANT WITH HEAVY ALBERT WATCH CHAIN 68 CM IN LENGTHBEAUTIFUL PENDANT ONLY WORN A COUPLE OF TIMES EXCELLENT CONDITION. NEW GUCCI .925 sterling silver Britt double-G heart logo drop necklace on a ball chain, authentic and made in Italy. It will be shipped with insurance Brand new!!!! 24" GOLD GUCCI CHAIN: 12.5G 10K-Y/G, GUCCI AND MARINER. 24" Gold Gucci Chain 10K Yellow Gold 12.5g. 10K -. 417. Color: Yellow. Guns, Jewelry, Tools, Electronics, Gold. While your item is in our possession, the sale, use, or display is prohibited. Sterling Silver Gucci Boule Necklace. Worn once as was an unwanted gift. Original holder also included.Dispatched with Royal Mail 1st Class. The Kuyashii Bee pendant is a minimal pendant that looks great with our 1.4-2mm chains. Inspired by the Gucci bee. Also available in silver. Material: Gold Plated A lloy. Weight: ﻿4g. Gucci Necklace And Bracelet 925 Silver. Necklace is approx 43cm long and the bracelet is approx 19cm long. Condition is Used. Come with original boxes and pouch. Dispatched with Royal Mail 1st Class. Classic Elegance Puffed Mariner Anchor Gucci STYLE LINK Chain Necklace 14K Solid Yellow Gold polished throughout. Very bright and flexible 22" long. Made In Italy. Clasp: 14k claw lock clasp. Stamped 585 14K.